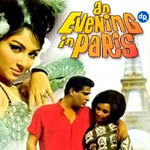 "An Evening In Paris" is a 1967 hindi film which has Shammi Kapoor, Sharmila Tagore, K N Singh, Rajendra Nath, Pran, Madan Puri, Sarita, Surendra Nath, David and Shetty in lead roles. We have 5 songs lyrics and 5 video songs of An Evening In Paris. Shankar and Jaikishan have composed its music. Mohammad Rafi and Asha Bhosle have sung these songs while Hasrat Jaipuri and Shailendra Singh have penned its lyrics.